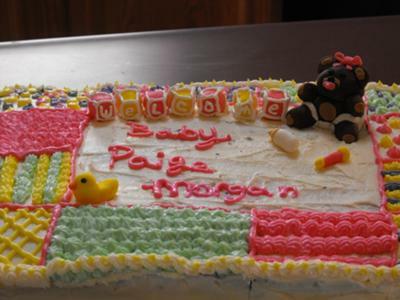 I made this baby shower quilt cake out of a 11x17 sheet cake and used butter cream icing. First I used just white icing and then divided the cake up like a quilt. Then I used colored icing to make the quilt design. I made the decorations: baby blocks, teddy bear, baby bottle, duck and little rattle out of fondant.